A perfect escape from the buzzing capital of Tuscany--Florence--Lucca lies just under a 2 hour (cheap) train ride away. Lucca is a beautiful city with a complete city wall from the Renaissance that has been since turned into a beautiful park. As Lucca has not seen a war since the 1400s, the architecture within the historic center (inside the walls) is well-preserved and features numerous beautiful churches and the remains of a Roman amphitheater. Maybe it's a case of the grass is always greener, but I actually much preferred Lucca to Florence. The vibe in Lucca felt very laid back, with everyone outside enjoying the wall. There were interesting shops and restaurants on every corner, and the opening times were a bit more reasonable for early eaters. Reaching Lucca from Florence is simple. From Santa Maria Novella, Trenitalia has trains departing to Lucca approximately twice per hour daily. Two train options are available: one goes towards Viareggio and takes approximately 1 hour and 20 minutes, while the other requires a connection in Pisa and takes approximately 1 hour and 50 minutes. To make your way from the Lucca train station to the historic center, it is only a five minute walk, and you can see the wall from outside the station. You'll enter the wall through Porta San Pietro. Kids under 4 travel for free on trains in Italy, so don't purchase a ticket for your little one. The Guinigi Tower is one of the most visible landmarks in Lucca, a massive brick tower with a few trees on top. The views from the top are marvelous and worth the 227 steps and entry fee. It does get crowded at the top, so my suggestion is to arrive early in the day. If you're traveling with a toddler, I'd suggest taking turns with your travel partner to visit the top. The Church of San Frediano is eye-catching from its exterior and definitely worth entering for its beautiful pillars, chapels, and the actual body of St. Zita, which you can see through the protective glass case. This church was built in the early 1100s and is on the Mediterranean pilgrimage route. 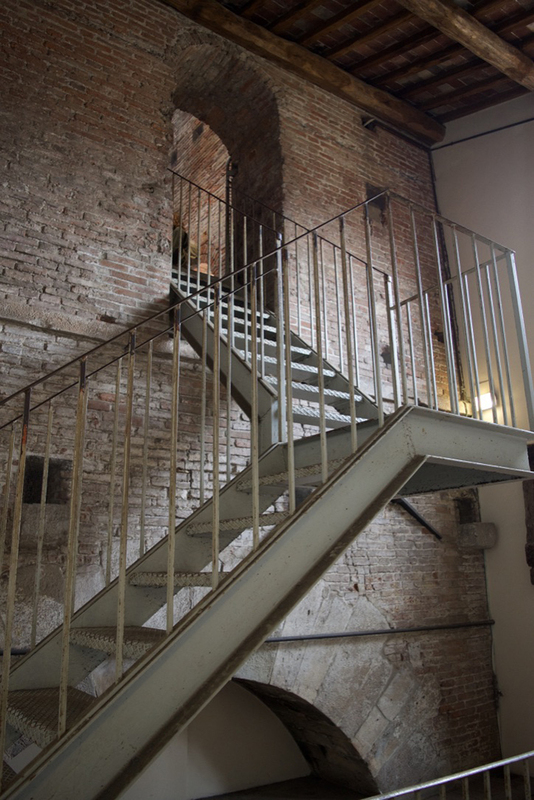 There is an entry fee for the Church of San Frediano (3 EUR), but it goes towards its continued preservation. The piazza in front of the Church of San Frediano has several (overpriced cafes) and a nice market with gifts and handmade chocolates (see below!). Piazza dell'Anfiteatro reflects the former Roman Amphitheater that it is built upon. After the fall of Rome, the amphitheater was disassambled and the buildings that currently stand in its spot are approximately 9 ft above the amphitheater. Within the piazza, there are numerous restaurants (with all day openings), stores, and cafes. On our last day in Lucca, we visited the Church of San Michele, which is a Romanesque church with an exterior much more impressive than the interior. The larger than life bronze angel, intricate carved columns, and impressive tower definitely captivate even little visitors. You can read even more about the Church of San Michele in Rick Steve's Florence and Tuscany guidebook*. Another Romanesque-style church in the church-packed center of Lucca is Santa Maria Forisportam. This church actually felt out of place and forgotten since the piazza in front of it was a parking lot, blocking some of its beauty. However, the intricate carvings on the facade make this church worth seeking out. It also happens to be right near some tasty food! Matta is perhaps the best gelato I've eaten in Tuscan so far. This little shop right around the corner from the Piazza dell'Anfiteatro is amazing! 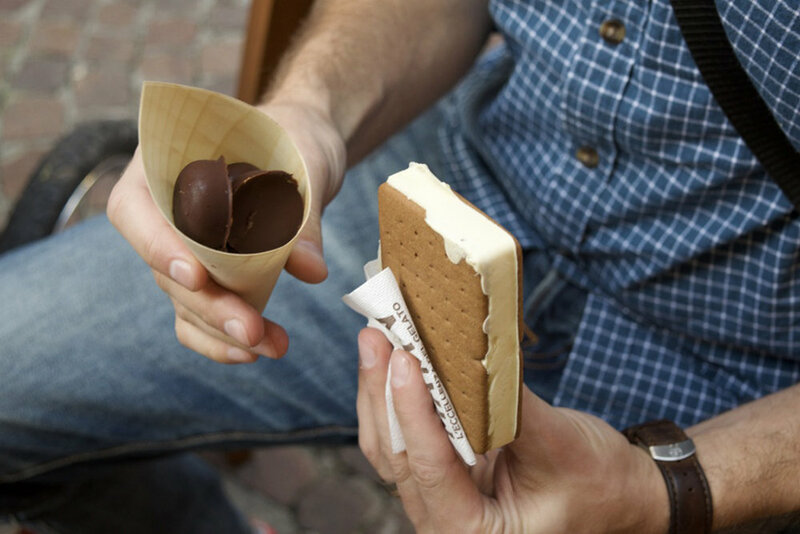 The flavors sold in the shop (like chocolate orange) are rich and the gelato is used to create ice cream sandwiches and chocolate covered ice cream bits. If you eat gelato anywhere in Tuscany, please make it Matta! 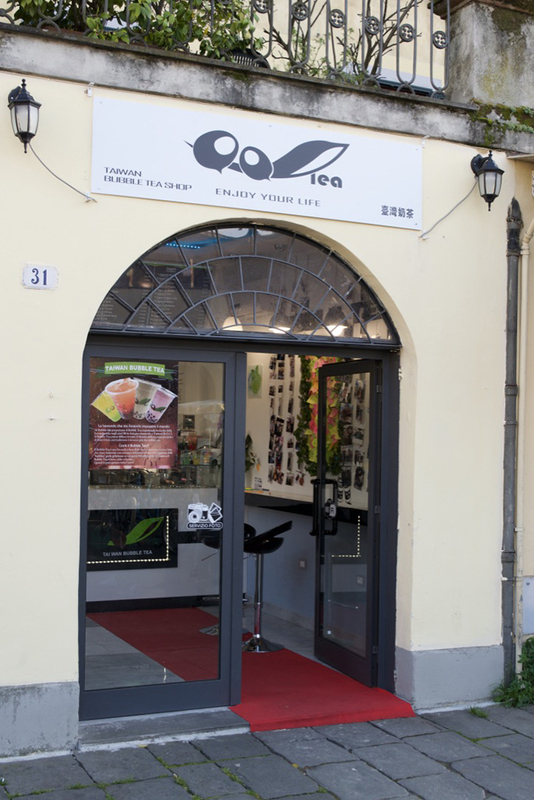 You can find Matta at Via Fillungo, 178, 55100 Lucca LU. If you need a sweet pick-me-up while in Lucca, one of the stalls in Piazza San Frediano sold homemade chocolates and their dipped orange rinds and ginger pieces were particularly noteworthy. Give them a try! Lucca is actually the last place I would have expected to find a decent bubble tea, but the bubble tea at QQ Tea was actually really good. J and I shared the iced green tea with regular tapioca pearls, and it tasted just like we were back in China! For an easy meal enjoyed while sitting on the steps of the Church of Santa Maria del Forisportam or Lucca's beautiful wall, stop by Forno da Tini. This little shop bakes delicious foccaccia pizza and the prices (by weight) are great. To keep costs down while traveling, I'm always on the lookout for cheap, delicious meals while traveling, and Forno da Tini checks all the boxes. The old fashioned chocolate house window display at Ristori Essenza del Gusto caught my eye and drew me inside. Considering that this was a multi-generation trip--with J's parents--it was an easy sell to go inside as my in-laws both have a serious sweet tooth. Ristori Essenza del Gusto can be found at Via Fillungo, 83, 55100 Lucca LU. Just down the street from Forno da Tini, Baci alla Francese Pizzeria caught our eye as another cheap option for lunch. Their sandwiches stuffed with spinach and ricotta were delicious and affordable. I really, really enjoyed visiting Lucca and found it particularly family-friendly, especially for toddlers. The limited traffic within the old city made it easy to navigate the streets with a sometimes-walking-sometimes-in-the-stroller kid. Because of the city's popularity with tourists, their were numerous restaurants serving food all day and there were plentiful options for grab-and-go meals as well as a small grocery store (Conad), making it easy to get food whenever your little one gets hungry. And when the little one has had enough of visiting churches, the botanical garden and complete wall (with a playground) is perfect to run and play on. There is also a carousel in one of the piazzas. For a young family, the Botanical Garden of Lucca is a great, green spot to let the "wild animals" roam free. The garden has a beautiful collection of Rhododendron (the genus of plants I studied), a small pond with turtles, and a little hill with alpine species. Entrance to the Botanical Garden of Lucca costs 4 EUR for adults and children are free. You can find the Botanical Garden of Lucca at Via del Giardino Botanico, 14, 55100 Lucca LU. The botanical garden has variable opening times depending on the season, so be sure to check online before planning your visit. The city wall around the historic center of Lucca is perhaps its most well-known feature. Just over 4 km long, the city walls formerly protected Lucca from invasion and those we can see today were built in the early 1500s. 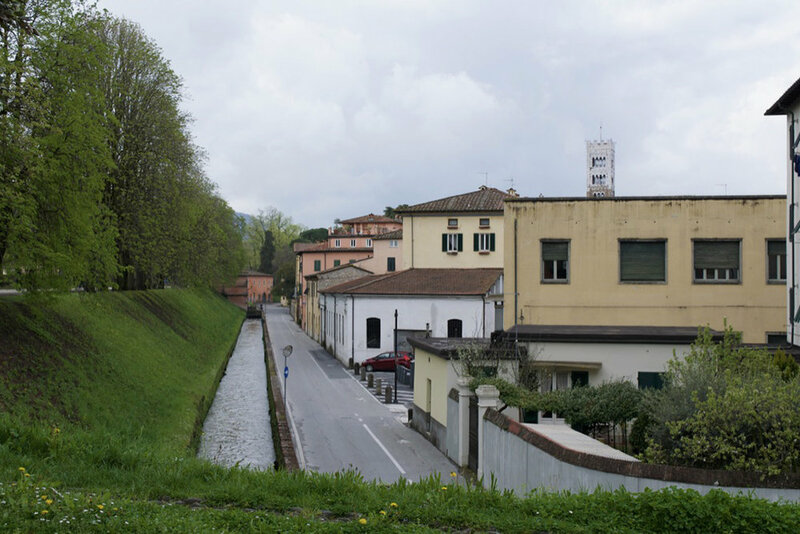 Because Lucca hasn't seen a war since the 1400s, the walls are very well preserved and were transformed into a park and public space in the early 1800s by Duchess Maria Louisa of Spain and Lucca. The walls feature an abundance of shade-providing trees, a playground, benches, and a few cafes. The walls are closed to traffic, making it an excellent place for children to run free (though do watch out for the bikers). Have you been to Lucca? What's on your Tuscany bucket list?